The final version of the National Farm Animal Care Council’s code of care for veal calves has been released and unfortunately includes almost all of the same welfare issues we raised concerns with back in February when the draft was released. The final code continues to allow the use of solitary crates for calves for a period of eight weeks. This can be extended on the advice of the herd veterinarian. As we’ve seen in investigations, veal veterinarians will do whatever is easiest for the producer and themselves – which generally means confining calves for ready access. 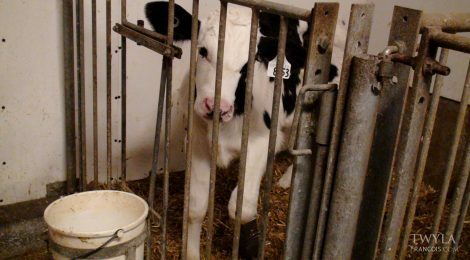 Given that the life expectancy of veal calves in Canada is just four to five months, this means they will spend nearly half of their lives in solitary confinement. The code also continues to allow painful, unnecessary mutilations like disbudding, dehorning and castration. The one positive is that the code includes information on barn fire prevention, however this is indicated as an annual “self-assessment”. Add to all this that the code is voluntary. It is not proactively enforced and third-party inspections are not conducted for compliance. If you want to help prevent cruelty to calves raised for veal — and all farmed animals — please consider adopting a plant-based diet.